Imagine you woke up one morning to find everything created by engineers had disappeared. What would you see? No cars, no houses; no phones, bridges or roads. No tunnels under tidal rivers, no soaring skyscrapers. The impact that engineering has had on the human experience is undeniable, but it is also often invisible. 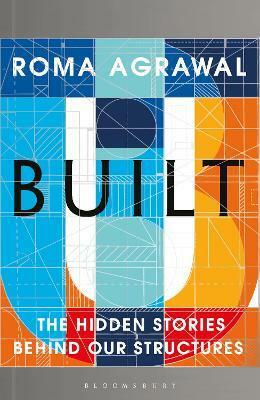 In BUILT, structural engineer Roma Agrawal takes a unique look at how construction has evolved from the mud huts of our ancestors to skyscrapers of steel that reach hundreds of metres into the sky. She unearths how engineers have tunnelled through kilometres of solid mountains; how they've bridged across the widest and deepest of rivers, and tamed Nature's precious - and elusive - water resources. She tells vivid tales of the visionaries who created the groundbreaking materials in the Pantheon's record-holding concrete dome and the frame of the record-breaking Eiffel Tower. Through the lens of an engineer, Roma examines tragedies like the collapse of the Quebec Bridge, highlighting the precarious task of ensuring people's safety they hold at every step. With colourful stories of her life-long fascination with buildings - and her own hand-drawn illustrations - Roma reveals the extraordinary secret lives of structures. Roma Agrawal is a structural engineer who builds big. From footbridges and sculptures, to train stations and skyscrapers - including The Shard - she has left an indelible mark on London's landscape. She is a tireless promoter of engineering and technical careers to young people, particularly under-represented groups such as women. She has advised policymakers and governments on science education, and has given talks to thousands around the world at universities, schools and organisations including two for TEDx. Roma has been awarded international awards for her technical prowess and success in promoting the profession, including the prestigious Royal Academy of Engineering's Rooke Award. She was awarded an MBE for services to Engineering in 2018. Roma has published articles on engineering, education and leadership, as well as being a television presenter. Roma is soon to appear on LEGO Masters on Channel 4, putting her engineering knowledge to use in judging structures built solely from LEGO. BUILT is her first book.